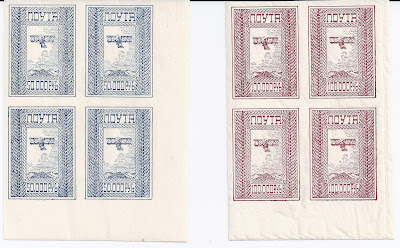 Trevor Pateman's Philately Blog: Russia: Air Mail fantasies? I have seen these items on several occasions, usually as single stamps. But what are they? Though there is no country name, it seems clear that they are supposed to be Russian and the denominations place them in the 1920-23 period. The word "Pochta" means that they are supposed to be postage stamps and the air plane suggests that they are for Air Mail. But though I have seen them described as "Essays" I think they are fantasies. But whose fantasies? If you think you know, please comment below!